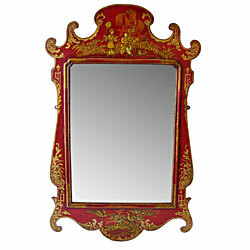 Chinoiserie Lacquered Mirror, circa 1735. This mirror had damage to its frame’s edges with sections of gilding and lacquer damaged and worn away from the use of glass cleaners on the mirror (Propriety glass cleaners contain alcohol and ammonia, both detrimental to furniture finishes). The lacquer (japan) was particularly dirty with accumulation of oxidized oil. Several structural issues were present with substrate splits in the timber resulting in a broken scroll and damaged lacquer surfaces. The substrate was consolidated, loose scroll re-attached and damaged lacquer stabilised. The surface was then carefully cleaned and waxed.